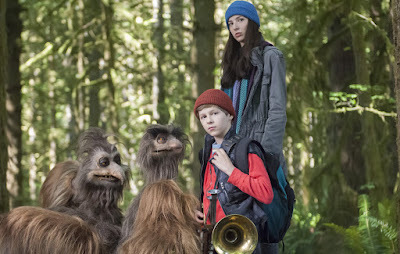 Snuggle in for some heart-warming family fun with Jim Henson’s Turkey Hollow. 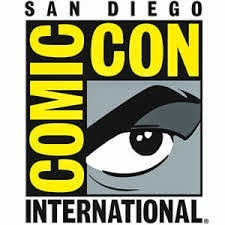 Based on a story and characters originally conceived by the incomparable Jim Henson (TV’s “The Muppets,” “Fraggle Rock”), Jim Henson’s Turkey Hollow stars Mary Steenburgen (TV’s “Last Man on Earth”), Jay Harrington (TV’s “Better Off Ted”), and Chris “Ludacris” Bridges (Fast & Furious 6) in a live-action adventure that will remind viewers what Thanksgiving is all about. Featuring state-of-the-art puppet effects from the renowned Jim Henson Company. 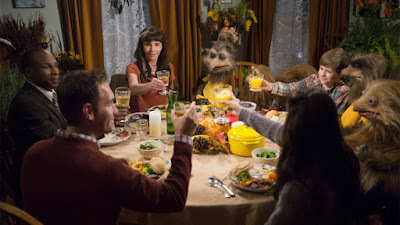 Filled with whimsical creatures and characters imagined by creative mastermind Jim Henson and his longtime writing partner, Jerry Juhl, the story follows a recently divorced dad (Harrington) and his two kids as they travel to celebrate Thanksgiving with their eccentric Aunt Cly (Steenburgen) in the rustic town of Turkey Hollow. Exploring the mysterious surrounding woods leads the kids to discover the secret of the legendary Howling Hoodoo. When a scheming neighbor threatens to take Aunt Cly’s farm, the family enlists surprising new friends to help save the farm — and Thanksgiving! Chris “Ludacris” Bridges appears as an on-screen narrator in the film. Jay Harrington plays a recently divorced Dad who is having trouble even saying the word divorce. He takes his two children to his Aunt Cly’s (Mary Steenburgen) farm for thanksgiving. His daughter is immediately upset at the lack of a cell signal and things only get worse as Cly explains that she doesn’t eat meat. His son has a better attitude and is ready for adventure. Along the way, the family learns of the town legend, the Hoodoo. The Hoodoo is a bigfoot-like creature that supposedly inhabits the nearby woods. A simple mistake by one of the kids gives a scheming neighbor a chance to take away Cly’s farm. To save the farm, the children and thanksgiving Cly calls on some unusual friends to save the day. When I heard about Turkey Hollow I was expecting a Thanksgiving version of my favorite Christmas movie, Emmett Otter’s Jugband Christmas. I clearly set my sights way too high and was disappointed. 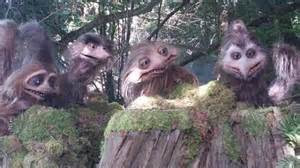 The creatures in the film play a very small role. They don’t have much personality and the film as a whole did not appeal to me. My seven year old son, however, seemed to enjoy it much more. He picked a favorite of the four monsters and didn’t seem to mind that they don’t talk, they only make noises. I also found it odd and completely unnecessary that Ludacris narrates in person (not voice over) often wearing a Mr. Rogers sweater. 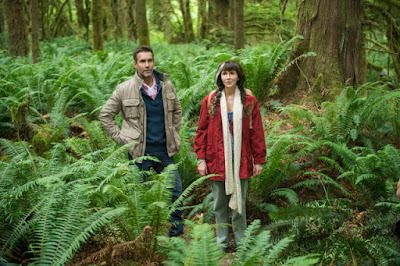 Mary Steenburgen, Jay Harrington and the two young actors that play his children all did a fine job. The story just wasn’t touching, believable or heartwarming enough to become a holiday favorite for me. The film is available on DVD with a widescreen 1.78:1 ratio. Most of the film takes place in the forest surrounding Cly’s home. The color palette is rather muted but the action is discernible in daylight and at night. There is nothing remarkable about the DVD transfer with expectations set fairly low. 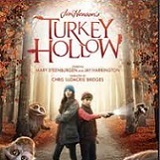 Turkey Hollow is presented on DVD courtesy of Lionsgate with Dolby Digital 2.0 sound. You never feel the directionality of the noises in the forest but dialogue is clear and intelligible. 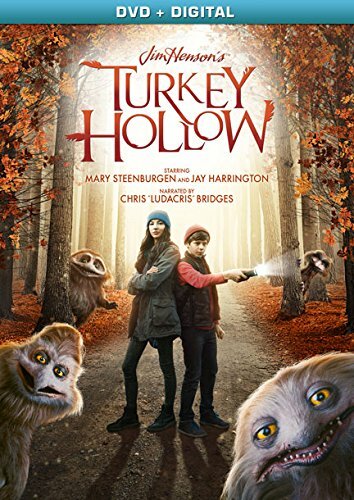 There are no supplemental features included on the DVD, but there is a digital copy of the film..
Turkey Hollow wasn’t the film I was hoping for. There was too little creature involvement and the creatures lacked personality. The film clearly pauses for commercials, which made it feel even longer than it was. I had a hard time getting into it at all, but my son seemed to enjoy it. The real test will come when we see if he ever wants to revisit the film. Even though he asks for his favorites like Despicable Me on a daily basis, I don’t expect that he’ll watch this again – even at Thanksgiving. The DVD contains no special features and nothing exceptional in the audio or visual departments. It would make a good stocking stuffer for an elementary school aged kid you don’t know very well.